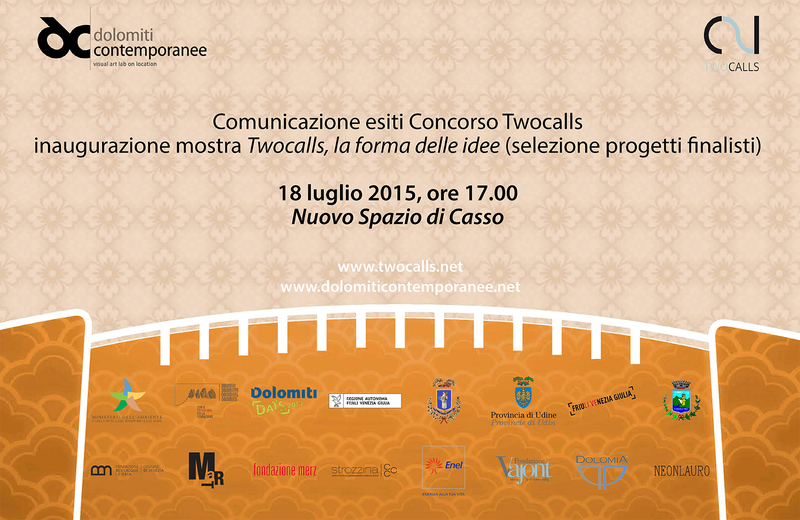 On 18th July, at 5 pm at the Nuovo Spazio di Casso, the results of Twocalls will be presented to the public. During the event there will also be the opening of twocalls, la forma delle idee (twocalls, the shape of ideas, in English), where a selection of the finalist projects will be exhibited. Through this exhibition the genesis, the meaning and the current state of this contest-ideative project, that aims to rethink the relationship between the Vajont area and its history, its tragedy, its human physical and cultural landscape, will be recounted. The exhibition will be open from 18th July to 16th August. Opening hours: from Thursday to Sunday, 10-12 am, 3-7 pm. During the opening the complete program of Dolomiti Contemporanee‘s summer activities in Casso and in the Friulian Dolomites will be presented too. Sabato 18 luglio, alle ore 17.00 presso il Nuovo Spazio di Casso, saranno presentati gli esiti del Concorso Artistico Internazionale Two calls for Vajont, lanciato da Dolomiti Contemporanee a giugno 2014. Con l’occasione sarà inaugurata Twocalls, la forma delle idee, una esposizione di alcuni dei progetti selezionati nella fase finale del Concorso, attraverso la quale si racconta la genesi, il senso, lo stato attuale di questo concorso-progetto ideativo, che vuol ripensare il rapporto con la storia, la tragedia, il paesaggio umano, fisico, culturale, dell’area del Vajont. dal giovedì alla domenica, 10.00-12.00 e 15.00-19.00. Verrà inoltre presentato il programma di eventi che si svolgeranno a Casso e nelle Dolomiti friulane nel corso dell’estate. Maggiori informazioni su www.dolomiticontemporanee.net . On April the 30th the first phase of the International Artistic Contest Two Calls for Vajont, launched in June 2014 by Dolomiti Contemporanee drew to a close. The Contest was conceived as an open platform of reflection on the territory of the Vajont and on its terrible history (October the 9th 1963), and as an opportunity to rethink, through the production of a series of renovating images, the landscape and some of the main symbols of that history today, transforming them from still objects-memories of the tragedy into active and shared “construction sites” of the mind and spirit. On Saturday May the 2nd, Dolomiti Contemporanee will host a day dedicated to culture and contemporary art. A talk, open to the public, is going to take place at the Nuovo Spazio di Casso, from 2 to 6 PM. The first phase of the twocalls contest is coming to its end. It only will be possible to send projects for a call for a wall and a call for a line until April the 30th. Twocalls is a contest of ideas that, through artistic projects, increases the amount of active and projective reflection on the critical Vajont area. Two Calls for Vajont is a double international contest of contemporary art that aims to develop a creative intellectual reflection, and with it a new cultural perspective, as well as innovative ideas, for the Vajont area. The artistic projects for the two artworks of “public art” to be made on the Vajont Dam (A Call for a Line) and on the front wall of the former elementary school of the Casso village, now New Venue of Casso (A Call for a Wall) will be gathered and published on this website. The winning projects will then be actually realized (see participate). two calls for vajont è un doppio concorso internazionale d’arte contemporanea volto a sviluppare una riflessione intellettuale creativa, e con essa una nuova prospettiva culturale e d’idee per l’area del vajont. verranno in questo website raccolti e pubblicati i progetti artistici per due opere d’arte pubblica da realizzarsi sulla diga del vajont (a call for a line) e sulla facciata dell’ex-scuola elementare del paese di casso, ora nuovo spazio di casso (a call for a wall). I progetti vincitori dei due concorsi saranno in seguito realizzati (vedi participate).